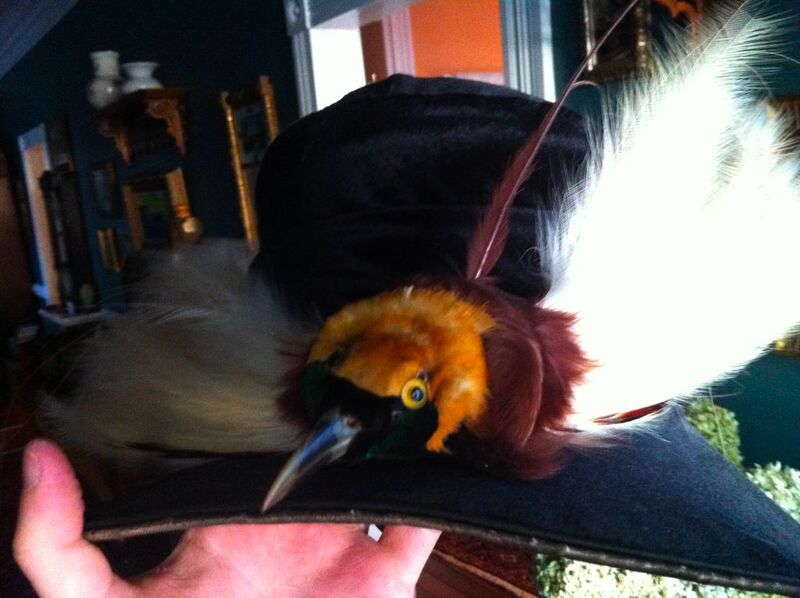 I am aware that the practice of using bird skins to decorate hats was once a serious problem. In the late 1800s and early 1900s, thousands upon thousands of birds were used, in some part, to make ladies look dandy. Great and Snowy Egrets nearly went extinct, and many other species were hunted, including: albatross, rails, gulls, owls, orioles, sparrows ... nothing with feathers seemed to be exempt. Wait. Wait. THAT'S IT? That's the hat? The final thing? Not, like, a first draft or something? That's what you pushed a bunch of species to the brink of extinction to create? That is literally the worst-looking article of clothing I have ever seen, and I lived through the 1990s. The bird on that hat is, I believe, a Raggiana Bird-of-Paradise. It's the national bird of Papua New Guinea, which is in Oceana. So, sometime in the early 1900s, that bird was flitting through a sun-dappled Papua New Guinean forest when it was blasted with some shotgun and killed. Then, its body was taken and put on a boat and shipped literally halfway across the world (and this was in the early 1900s, when it probably took forever to sail across the Pacific and a bunch of guys probably died of scurvy). Then, it's still-decomposing corpse was brought, finally, to some hatmaker somewhere who, instead of at least respecting the bird and attempting to craft an item worthy of such a majestic species, he was like "uh yeah just like split it in half and glue it to that black hat over there." The Raggiana Bird-of-Paradise was nearly hunted to extinction for use in hats, but that all stopped and now the bird is doing fine. I guess what I'm saying is that for all our problems, sometimes I'm glad it's 2012.